Beautifully designed rabbit wine opener. This unit comes with a smooth operating foil cutter and an extra corkscrew pull. The packaging is sleek and elegant, perfect gift box for any occasion. PERFECT GIFT for wine lovers. 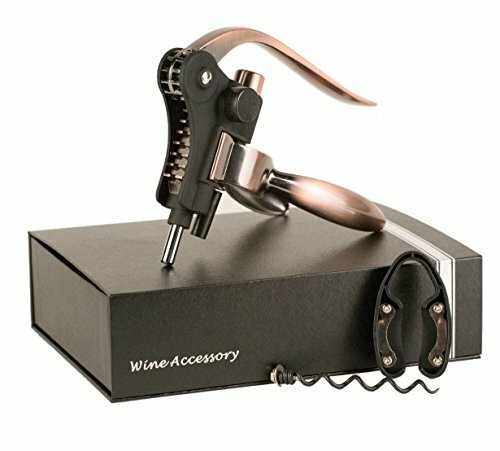 This is the ideal gift for any occasion as it comes complete with the beautiful wine bottle opener in the sleek elegant gift box with two extra accessories, the foil cutter and an additional corkscrew worm pull. EASY TO USE. The size and structure of the wine bottle opener allows for needed leverage to easily open wine bottles. This is the preferred bottle opener for those who open wine bottles all day, or those who want to efficiently open one. ELEGANT. This wine bottle opener and case are so simple and elegant that you will want to show it off and not hide it away in a shelf. DURABLE. The wine bottle opener is made from the highest quality materials. B.K. Gadgets provides a 5-year warranty on the wine bottle opener. If you have any questions about this product by B.K. Gadgets, contact us by completing and submitting the form below. If you are looking for a specif part number, please include it with your message.